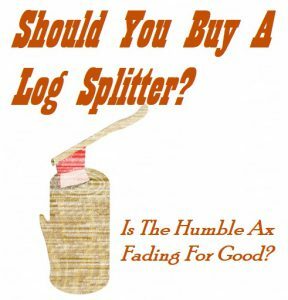 Should I buy a log splitter, do I really need one, whats it going to cost me?. These are questions I’m asked quite a lot. I can fully understand why it isn’t an easy question to answer. Unless you have been around firewood all your life, it can seem like a new way of living. There is a lot to consider when thinking about purchasing a log splitter from the up front cost, what size splitter do you need, gas or electric, and how many logs will you be splitting. These are all genuine concerns and are all important and I hope to be able to answer these questions for you. But there is one thing a lot of people don’t think of especially when they are younger and that is just how much of a toll splitting wood with an ax or maul does to your body over the years. 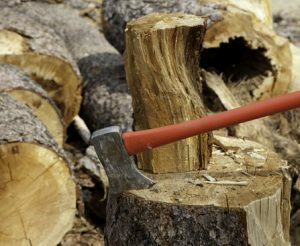 Even if you use the best axe for splitting wood, after a while it can become munadne and tough. This is something I didn’t consider when I was younger. I use to think I’m in great shape, what harm can swinging an ax do?. Many years later, the toll has been taken. My back and shoulders are not anywhere near as good as there were back in my younger days. Nowadays I can’t go on without a log splitter. So the quick answer to whether or not you should buy a log splitter is heck yes!. 3 Do You Really Need A Log Splitter? 4 Choosing To Buy A Log Splitter? 4.1 Which Splitter Would You Prefer: Machine Or Axe? There are a lot of reasons to own a log splitter and very few if any reasons to not own one, the only reason I believe to not own one is cost which I will speak more on below. I believe the sheer amount of time and effort a wood splitter will save you is a genuine reason as to why you should own one. Not having to spend so much time splitting logs the old way will free you up to do other things, that you certainly would prefer to be doing then this chore. By the time you have split a few rounds with an ax you could have been done for the day with a log splitter. Especially if time is a big thing for you then I would highly recommend a kinetic log splitter, those machines have incredible quick cycle times. That will turn 3 hours of splitting down to an hour, with cycle times as low as one second. If you like the sound of that I have compiled a list of what are the best kinetic splitters going on the market which explain more. Sometimes when you’re splitting logs using an ax or maul, you will come across logs that you just can’t get through. No matter how hard you try and how many attempts you make. Some logs are just too stubborn for the humble ax. That is unless you have a strong wood splitter that will split right through that stubborn log. For most people, a 22 ton log splitter will be the weapon of choice. I find the 22 ton range to be a good entry level machine. A 22 ton machine will provide plenty of splitting force and get through all but the most stubborn of logs. Another good thing about 22 ton units is that is where they start to add being towable and my favorite feature, the ability to split vertically. I highly recommend a 22 ton machine for those who are going to split 10 cords a year and need a lot more power. See the best 22 ton log splitters here. So while it’s all well and good saying “yes you should get a lot splitter” I understand it isn’t as simple as going out and getting one. When you consider the upfront cost of some of these machines it can be a little daunting and even off putting for a lot of people, and that is a genuine concern.Some log splitters cost several thousands, but on the other end of the scale you can get a decent machine for a few hundred dollars. So it really comes down to knowing what you need and don’t need. The question that needs to be answered there is do you really need a heavy duty log splitter? If you’re only going to be splitting one to five cords a year with logs that aren’t very hard or knotty then you won’t need such a large machine. For people who need to split those logs I have put together a list of what I consider to be the best 7 ton log splitters. I find 7 ton machines are quite capable for doing most household splitting needs. Most of the splitters on that list won’t break the bank either. You may be surprised at the shear amount of power and speed you can get from a few hundred bucks these days. If this sounds like a lot to you then there is one or two things to consider. A small up front cost now will help save you big time down the track. 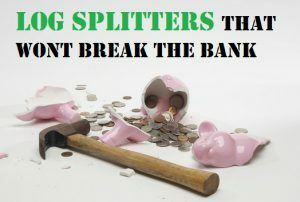 It is a lot cheaper to purchase your own splitter, then it is to rent one over the years. So if you know you are going to be reliant on firewood for the home, it makes complete sense to invest in a decent log splitter from the get go. Don’t go too cheap or you may end up paying a lot more in the long run. The other thing is how much this will save your body over the years compared to the ax. While swinging an ax is cheaper financially, it won’t be cheaper on the toll it takes on your back, shoulders and legs. Do You Really Need A Log Splitter? While there are all types of log splitters available ranging from a few hundred to thousands of dollars. The question you need to ask yourself is ‘Do you really need to buy a log splitter?’. There is absolutely no point in buying one if you only intend to use it once. Go out and rent one for the day. But if you and your family rely on firewood to heat the home, or if you simply love campfires more than most. Sure thing, buy a log splitter. It will be the best investment you can make this winter. Choosing To Buy A Log Splitter? If you have decided ‘yes!’ now is the time to buy a tool that will not only save time, but also your body from deteriorating as fast. Congratulations are in order. But how the heck are you suppose to choice the right size and model for your individual needs?. 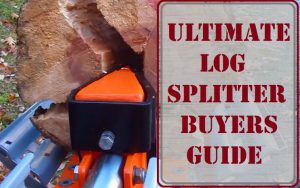 This short video below shows a few of the different log splitters available and how to get our buyers guide to kick start you in the right direction. Choosing a log splitter to buy becomes easier once you know what you need. Which Splitter Would You Prefer: Machine Or Axe? Just for fun, watch a established Axe Man compete against a horizontal log splitter. I know which job would suit me to the ground. Thank you for sharing this post, I found it very helpful. I had not seen a machine Wood splitter before. In the back of my mind I remember my Grandad speaking highly of them, but never really looked any further into them. Now it has come time for me and my family to use wood to keep warm over Winter. So I am glad to have found this article on whether or not I should stick with the axe, or upgrade to a log splitter. Thank you for explaining it in simple to understand language. Where I am from, how an ax is used to split Wood is remarkable good for body exercise. In swinging the ax the body muscles are strengthened and becomes well shaped. In the video demonstration I noticed that the standing posture of the ax man while swinging the ax could be very damaging to his spines and body muscles. I therefore chose the machine splitter as I don’t a great back as it is. Neither does my Husband. Anytime Dorcas, I’m glad you see the benefits to using a log splitter over an ax. If you can afford one, then they are certainly well worth the investment. Many thanks for this awesome post and I read your post with more than a passing interest. I used to sell a lot of firewood years ago, approx back in the 80s. I used to cut and split all of the logs with an axe, so it was very labor intensive. One really earned their money back then. However, I am in awe of the log-splitters that are available at the moment. They are so technically constructed and designed, so much so, they really make lite work of the timber and especially the knotted parts. As regards the end of the axe,I am not sure, I suspect that it may be around for some time to come yet. Hi Phil, I bet you sure wish that log splitters were more prominent back in the 80’s. I can imagine how labor intensive it would have been to split endless amount of wood. Not to mention the strain it can take on the body. I 100% agree the end of the axe is certainly not going to happen. The humble axe comes in handy more times than not so they are certainly a wise investment.